The Wolf of Wall Street, Jordan Belfort, served time at Taft Correctional at the same time Tommy Chong was there. They were cellmates. Jordan saw that Tommy Chong was writing The I Chong: Meditations from the Joint and wanted to do the same. Tommy Chong read his first draft and didn't like it. Jordan rewrote the book and this is the version that was released. In today's TMZ interview, Tommy rehashes the same story. It's time for our annual Holidoobie sale, but this year it's even better. 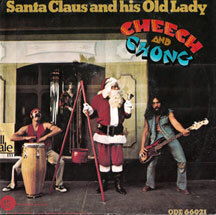 Beginning immediately and running until Saturday December 21st 12AM New York, there's no domestic shipping on anything, plus you get a FREE CHEECH AND CHONG CD (our choice) with every order of $25 or more. If you've ever wondered what it's like backstage after a Cheech and Chong comedy show, well here you go. Highlight of the video is a disabled man, who could barely speak, was able to say one word...marijuana. The Museum of Contemporary Art San Diego is to present an exhibition entitled “Chicanitas: Small Paintings from the Cheech Marin Collection” from 21 December 2013 until 23 March 2014 at the MCASD Downtown, Jacobs Building. Perhaps better known for his work as an actor and director, particularly as part of the comic duo Cheech and Chong, Cheech Marin is bringing together pieces of Chicano art from the past 25 years. He has created a renowned collection and organised exhibitions which have travelled across the United States. For “Chicanitas”, Marin has brought together a rich variety of works which demonstrate the complexity of Chicano art. The word Chicano is used to describe people from Latin America living in the United States. The Chicano movement is an extension of the Mexican-American civil rights movement of the 1940s. The Chicanos demanded citizenship, no longer wanting to be be classed as immigrants or foreigners within the United States. Within their local communities, Chicanos speak the Spanish language, follow the Catholic faith and retain a close connection to their country of origin. Tommy Chong has been cast as Cloris Leachman's love interest in an upcoming episode of Fox-TV's Raising Hope. 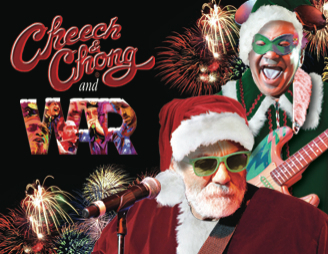 On December 30th, the Cheech and Chong Holiday Tour featuring WAR is coming to The Joint at the Hard Rock Hotel and Casino in Tulsa, Oklahoma. Tickets go on sale Thursday, November 21 at 10am local time here. Hollywood, Fla. – Comedy and charity will take center stage as Broward House presents Cheech & Chong, a special benefit performance, at Hard Rock Live at the Seminole Hard Rock Hotel & Casino on Sunday, December 15, 2013 at 7 p.m. Tickets go on sale Friday, November 8 at 10 a.m. One-hundred percent of the proceeds of ticket sales will benefit Broward House, South Florida’s oldest and largest HIV/AIDS community service organization. At the world famous Troubadour in Los Angeles where they were initially discovered, Cheech & Chong recently announced their first tour in over 25 years. Successful beyond their wildest dreams, the iconic comedy duo Cheech & Chong defined an era with their hilariously irreverent, satirical, counter-culture, no-holds-barred comedy routines. Cheech Marin and Tommy Chong’s phenomenal success began on the stand-up comedy circuit which led to nine hit comedy albums and eight hit films, breaking box office records, shattering comedy album sales, garnering multiple Grammy nominations and mesmerizing fans for more than a decade. With those nine albums released from 1972 through 1985, Cheech & Chong were nominated for four Grammy Awards, winning the Grammy Award for Best Comedy Album with their third album, Los Cochinos, released in 1973. Big Bambu, their second album, was the biggest selling comedy record of all time in 1972 and remained so for many years. Their stunningly successful comedy streak transitioned to film in 1978 with their first movie, Up In Smoke, the highest grossing comedy of 1978, topping $100 million at the box office. Cheech & Chong co-wrote and starred in a total of eight feature films together, all directed by Chong. Tickets cost $104, $79, $69 and $49;* all seats are reserved and available at all Ticketmaster outlets online at www.myhrl.com, www.ticketmaster.com or charge by phone: 1-800-745-3000. Doors open one-hour prior to show start time. *Additional fees may apply. Founded in 1988, Broward House is South Florida’s oldest and largest HIV/AIDS Community Service organization with 15 locations throughout Broward County. It provides services up to and including medical care, substance abuse and mental house counseling and, in some cases, housing to over 6,000 Florida residents, yearly. For more information, please visit www.browardhouse.org or call 954-522-4749. On December 15th, the Cheech and Chong Holiday Tour,featuring Cheech and Chong and WAR, is coming to Hard Rock Live in Hollywood, Florida. Tickets go on sale this Friday, November 8th at 10am local time via the ticket links above.